Want to improve your projects’ success? Unlike others that seize on one project or improvement methodology, AP conforms the best of all successful management and project delivery methods to your needs. 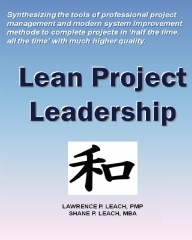 Your customers and the complexity of your projects determine when and where to use the elements of Lean, Critical Chain Project Management (CCPM), the Project Management Body of Knowledge (PMBOK™) and Six Sigma. We support your leadership with tools, techniques, and coaching to achieve real results. Although results vary, we routinely help clients achieve audacious goals; i.e. CCPM alone produces 50% improvements in profits, throughput, revenue, cycle time, product quality and delivery dependability. The LPM approach achieves these results while reducing overtime and stress for all members of your teams and setting the stage for future continuous improvement. Our experience includes helping private corporations and non-profit organizations, including major government projects, with projects of varying size and complexity, and at project stages ranging from R&D through maintenance and repair to decommissioning. CCPM+, our project management software add-in to Microsoft Project now includes the Project Chain View. The Project Chain View enables project teams to know exactly where to focus work to keep the project on schedule, and to plan ahead for schedule improvement if and when needed. This tool turns project management around, from looking through the rear view mirror with variance explanations to driving the project forward by looking through the windshield to focus on what matters most.